My mom's birthday is this month, and I wanted a cute way to give her a bunch of my soap. I have obsessively poured over Pinterest looking for the cutest packaging I could find (do you do that too? I've gotten to the point where anytime I make anything fun my family asks 'Oh, did you see it on Pinterest?" Sheesh, but, um, yes...). 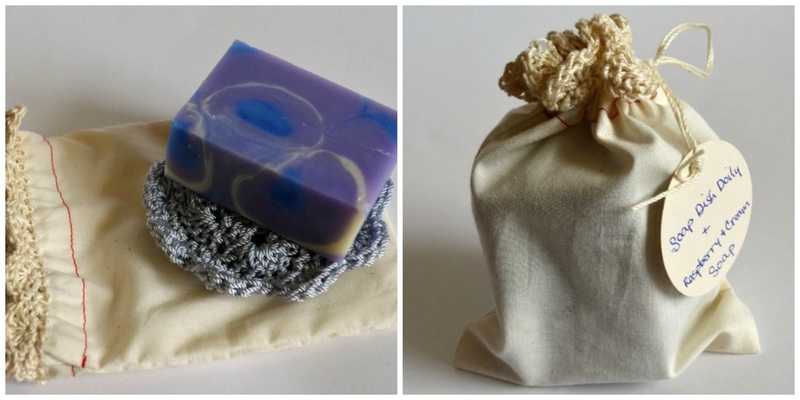 I really felt myself drawn to the soaps individually packaged in little muslin bags. I priced out the bags on Amazon and a couple of my soap supply sites, but the cost was pretty prohibitive. I had to either buy in inappropriately huge quantities, or pay way too much for just a few. Either way I was spending more money than I wanted to for something that was going to get thrown in the trash anyway. Clearly my only option was to make my own! I used this YouTube vid to make up a bunch of bags, but I added a twist to them. I had read somewhere that if you use your sewing machine to zig-zag over the edge of fabric you could crochet into the stitches instead of having to go through the tedious marking/awl-punching/fighting-to-crochet-into-fabric edges I've done before. (I read it probably a year ago, and now I can't for the life of me find the place I read it. I really would like to give credit to the brilliant mind that shoved me in this direction, since I totes would have never thought of it on my own.) I set the stitch width on my machine to 5 and my stitch length to 4 and zig-zagged over the top edge of the bags before I sewed the sides and bottom together (like in the YouTube vid). That gave me awesome sewn loops to crochet into. 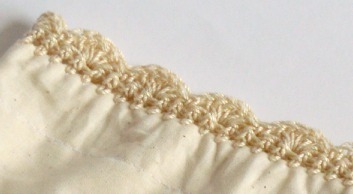 I used a C hook and #5 crochet thread to add an edging to the top of the bags. I love the way they turned out. They look like the vintage linens that my grandma got from her mother and grandmother. It was pretty quick and easy once I got the hang of it. 1. Make sure the zig-zag goes OVER the edge of your fabric. It will make little mountain peaks (or v's) instead of the zigs and zags. 2. Only crochet into the "down" side of your mountains. If you go into both sides the crochet starts to ruffle, which sounds good, but looks bad. 3. Crochet a 3 row edging so that you start and end on the front of your piece. The zig-zag edge is all but invisible if you start on the front. 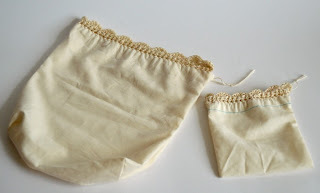 I made my bags in two sizes, the small ones are 5" x 6" and will hold a bar of soap and a crochet soap dish doily. The big bags are approximately 10" x 12" and will hold a bunch of bars of soap, or slippers, or anything else I can think of! I can't wait to make some cute pillowcases for Mims using this technique! I've been having so much fun lately practicing my soap making techniques. I picked up a copy of Soap Crafting by Anne-Marie Faiola (the Soap Queen! ), and I'm now going through it, Julie & Julia style, trying to make every recipe/design in the book. She's got a Pinterest/Instagram contest going on until September 23rd, which I'm going to add my pictures to, but I think just having a reason to practice all the new techniques makes me a winner already. 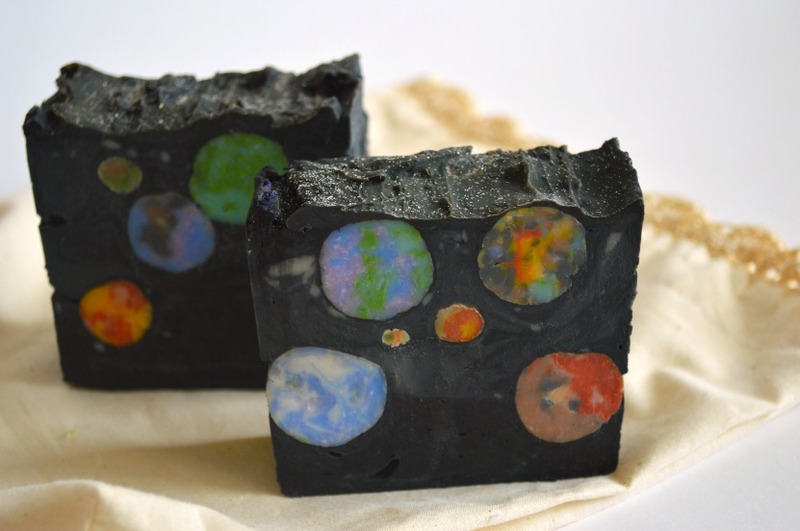 This is my Planetary Explorer soap that I made for Jake. His birthday is this month too. 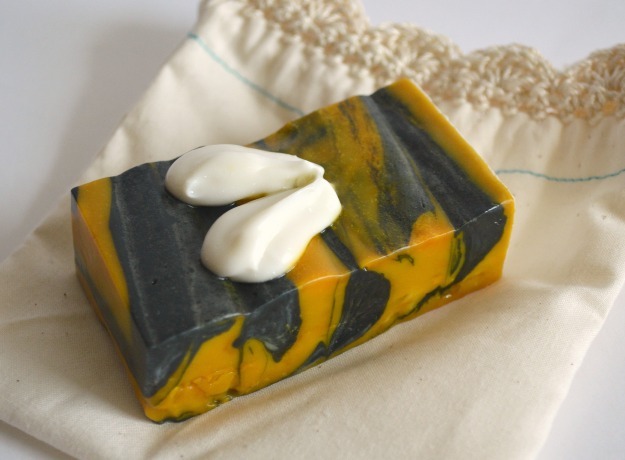 And this is my Queen Bee soap. I used a Milk & Honey fragrance with it, and I made it because we had a small hive of bees that were living near the house. I liked watching them, and they were used to us, but my brother-in-law is severely allergic to bee stings, and we just couldn't risk his safety. I had hoped they could be saved and given to a local bee keeper, but it turns out that they were just barely surviving, so when the bee people came to get them the bees became very aggressive and had to be destroyed. Broke my heart. I would have planted more flowers if I had known. Okay, on that super depressing note, I'm going to go. Have a great holiday weekend!!! 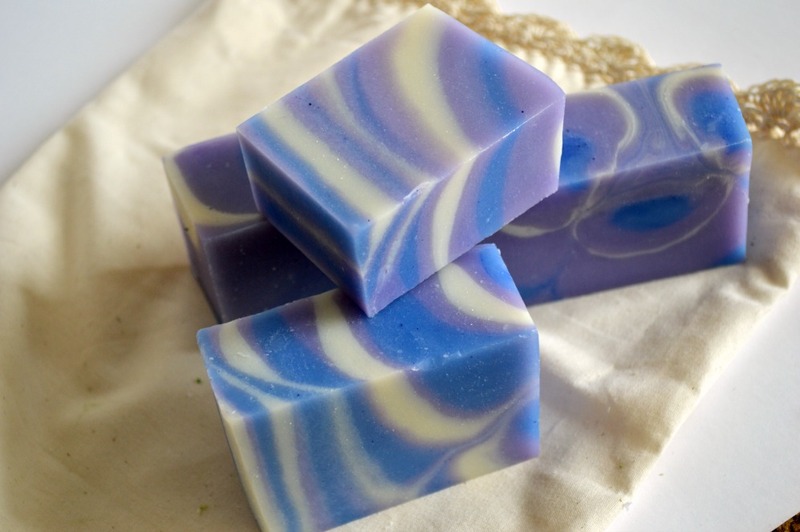 Those soaps rival any beautiful marbled paper I've seen. They are exquisite! Lucky are the recipients of your labors. 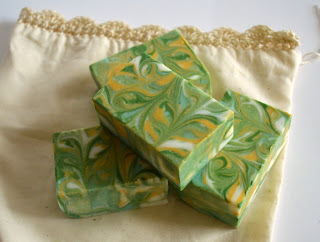 Please share any other soaps you make. Thank you so much! I've actually been looking at marbling designs for inspiration, there are some amazing artists doing incredible things with just a few drops of ink on some water! Kinda makes me want to try that too. LOL!!! !